"Uranus the sky god is my guardian, I am Sailor Uranus!" Haruka is ruthless. It could be said that her motto is: "Fight now, and forget about asking questions." She will stop at nothing and sacrifice anything to achieve a goal. She takes her duty to protect Sailor Moon from anything outside of this solar system very seriously. 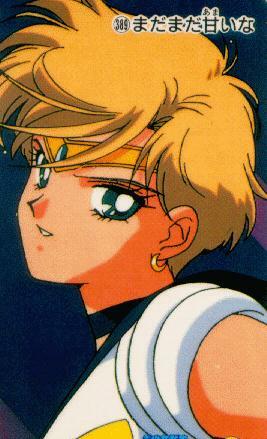 She has a flagrant dislike for the Starlights, Seiya in particular, because she sees them as a threat to Usagi. She has a big sister type affection for Usagi and in the Japanese version calls her neko chan. (cute kitten) Oh, one more thing, Haruka is a FEMALE and only a FEMALE! She always has been and always will be. Haruka is in love with Michiru. Haruka poses as a student at Mugen Gakuen High school. She prefers wearing boy's clothes and wears a boy's uniform to school. She possesses the 1st talisman, the space sword. Her castle is the Mirada castle. In Sailor Stars she and Michiru faked becoming evil so that they could use the bracelets Galaxia gave them to steal her star seed. Unfortunately, since Galaxia had no star seed, the plan failed.